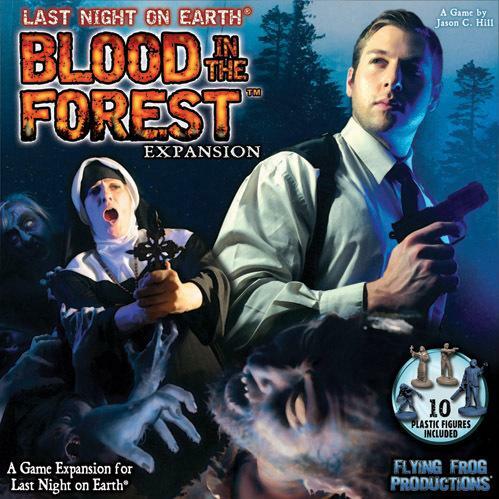 The Blood in the Forest Expansion sees the Heroes fight their way deeper into the forested mountains, and can be added to LNOE: Timber Peak or directly to the original Last Night on Earth. Featuring a full set of new Forest Boards (4 Corners and 4 Straight pieces) as well as a new double-sided Forest Center Board (with the Airfield), a set of 7 vicious new Feral Zombies, 2 new Heroes (Sister Ophelia, the reformed nun, and Agent Carter, an FBI agent who knows more about the outbreak than he lets on), as well as a host of new Hero and Zombie cards, counters, Scenarios, and Game Mechanics. Blood in the Forest also expands on the Fire and Upgrades systems originally introduced in LNOE: Timber Peak. As the Zombie plague spreads, the forests will run red!